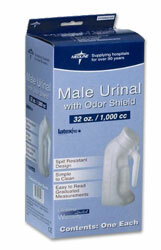 Light-weight washable plastic male urinal with lid. Translucent material permits measuring ease and visualization of contents. Snap tight lid prevents messes and odors. Graduated in 25cc and 1 Oz increments and holds up to 1000cc.